SCP-123-J in its natural state. Special Containment Procedures: Any instances of SCP-123-J are to be contained within the staff refrigerator at Site ██. Staff use is allowed; however, staff are warned that ingestion of SCP-123-J and subsequent information of its composition can result in shock, paranoia, and a healthier lifestyle. If personnel come across an instance of SCP-123-J, they are to purchase it and preferably some instances of SCP-123-J-2. 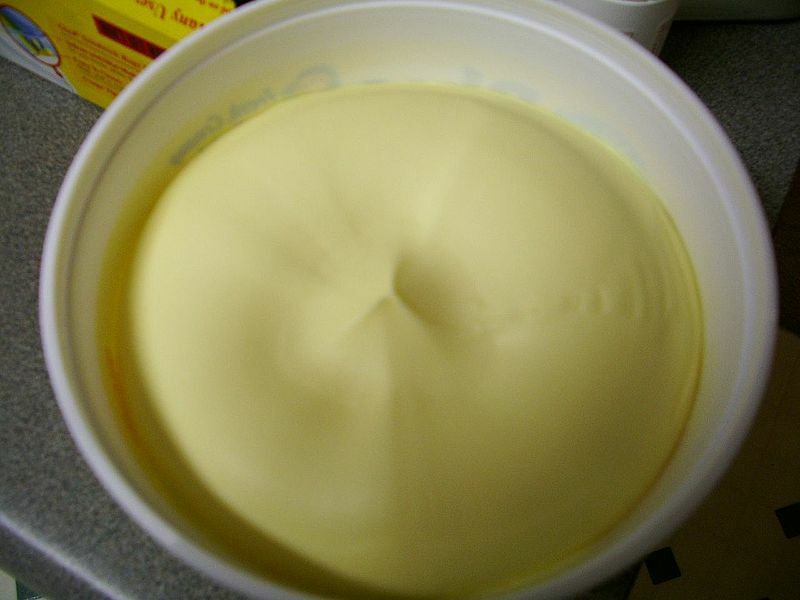 Description: SCP-123-J-1 is a small plastic tub with the brand label “I Can't Believe It's Not Butter” on its cover. Investigation has been made into Becel company, creators of "I Can't Believe It's Not Butter"; however, no links to any occult organizations have been found. Contained within SCP-123-J-1 is a compound of oils forming into an edible substance, designated SCP-123-J. When a subject spreads SCP-123-J on any grain product and ingests it, they report SCP-123-J to have a taste similar to butter. When informed that the substance is not organic butter, subjects typically report disbelief. SCP-123-J melts when exposed to heat higher than room temperature. When left refrigerated SCP-123-J slowly solidifies into its original, spreadable state. SCP-123-J was originally purchased by Agent C█████ in a Safeway supermarket located in ██████, Maryland. Upon ingesting it through the use of a SCP-123-J-2, the Agent handed SCP-123-J to Agent F███, urging confirmation that the substance was butter. Agent F███ ingested the remaining portion of SCP-123-J-2 and alerted the Foundation. Although initially suspected of misinformation, Agents C█████ and F███ were later promoted. Dr. █████: How are you feeling? D-6539: Like I have obtained my recommended amount of nutrients and vitamins, and all at a very low price! Dr. █████: What if I told you SCP-123-J was not butter? D-6539: Really? (Turns to Security Camera 1) I can't believe it's not butter! Dr. █████: (Lets out small chuckle) That's right, SCP-123-J is actually composed of vegetable oils. Without the addition of all that pesky saturated fat you find in organic butter, you can trust SCP-123-J to deliver the flavor you're used to, but with a lower price and a healthier heart! Closing Statement: Although D-6539 was still sent in for month-end termination, he did so with the confidence that he had reduced his cholesterol intake to a healthy standard thanks to SCP-123-J.